7 Kids and Us: Suprizamals- Which One Will You Get??? 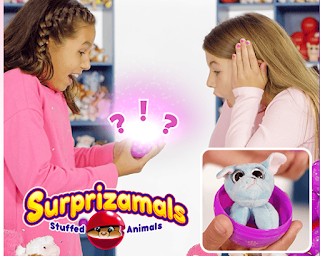 One of the hottest trends for my kids is Surprizamals. They ask me all the time to get them one, just so they can see which new (or rare!) one they get! It's so much fun! Surprizamals are now into Series 3, after the success of Series 1 and 2. For $19.99, you get 4 fun packs that you can open and be surprised! If you are SUPER lucky, you will get an ULTRA RARE Surprizamal! 5 different colors randomly filled with different plush styles. The Surprizamals - Wackys are super soft, hand crafted with some trendy eyes.